Home >> A Books >> The First Days of School: A True Tell-All Book! Whether you're a nervous neophyte facing your first day of school or a skilled veteran facing another first day of school, The First Days of School: How to Be an Effective Teacher, by Harry and Rosemary Wong, is a must read. "The first day of school or a class -- even the first few minutes -- will make or break a teacher." Scary words from authors whose book, by their own admission, wasn't written to provide a plan or a model for successful teaching, but rather to help teachers formulate their own plans. But don't worry. The book provides plenty of help. Step 1. Look at the five units, and note the book's framework. Units A and E provide general understanding; Units B, C, and D, specific techniques. Step 2. Read the table of contents for a quick overview of the chapters. Step 3. Thumb through the book, and note each chapter's "Key Ideas." Read the chapter if the ideas interest you. Step 4. Read the summary list of concepts at the end of each chapter. 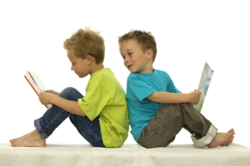 It is not, say the authors, necessary to read The First Days of School "from cover to cover. Browse through the book to familiarize yourself with its structure so that you can refer to the right parts when you need help." Good advice! Let's browse through the five units together and examine a few key ideas from each. Bear in mind that the book includes hundreds of practical suggestions on topics ranging from "How to Dress for Success" to "How to Introduce Yourself to Your Class." The ones mentioned here are just a few of my personal favorites. design lessons for student mastery. In addition, the authors say, effective teachers use all the resources available to them. They use "proven research-based practices" and they incorporate the successful practices of other effective teachers into their own classrooms. "Here's the biggest secret to teaching success," the book whispers, "Beg, Borrow, and Steal!" Organize a 'First Day of School' Celebration. Stand at the entrance to the school so that no one will fail to receive a warm, friendly welcome. Bring out the school band to play at the curb or entry. Hang up a welcoming banner. Distribute a school newspaper extolling the virtues of the school and the wonderful spirit of the teachers and students. The ten chapters in Unit C focus on the characteristics -- and benefits -- of a well-managed classroom. The effective teacher, say the Wongs, begins the year not with an activity, but by establishing classroom management procedures. "Student achievement at the end of the year is directly related to the degree to which the teacher establishes good control of classroom procedures in the very first week of the school year," they say. The climate of the classroom is work-oriented but relaxed and pleasant. The book also suggests specific techniques teachers can employ to ensure a well-managed classroom. Those include posting assignments, making sure students know assignments are based on objectives, and knowing how to praise and encourage students. evaluate the learning to determine whether students have mastered the concept or skill. Step 1. Pick a verb (from Bloom's taxonomy) identifying the kind of thinking skill needed to achieve the objective. Step 2. Complete the sentence with the skill that must be performed or mastered. Accomplishment -- a statement of what is to be achieved. Unit E emphasizes the personal benefits of becoming an effective teacher and explains the difference between a teacher and a professional educator. "A professional," the Wongs say, "is defined not by the business a person is in, but by the way a person does business." A professional educator, they note, says, "What do I need to know in order to do what I need to do?" The First Days of School isn't a book of activities, lesson plans, formulas, or pneumonic devices you can teach. It's a book of procedures and techniques that will help you ensure that your students get the most from your teaching. It isn't a book filled with abstract educational theory. It's filled with practical suggestions for achieving what you're striving for. It isn't a book about how students learn. It's a book about how -- and why -- effective teachers teach. Moreover, it's a book that is easy to read -- and browse. The layout is clean and user-friendly. The type size and abundance of white space make it easy on the eyes. The photographs, illustrations, and variety of type styles highlight important ideas and concepts. And like a Joke-of-the-Day calendar, you can pick it up anytime and find another gem of an idea. On the title page of The First Days of School, the Wongs say, "Some people go into teaching because it is a job. Some people go into teaching to make a difference." This book is clearly for the teacher who wants to make a difference! "Teaching is a craft, a highly skilled craft, that can be learned." "Education should be challenging, exciting, engrossing, and thought-provoking, but not fun. If you believe that learning should be fun, you are doing the students a disservice. School is where you go to learn skills that help make you a productive citizen and grow to your fullest potential as a human being." "The more the school and the family are joined as partners in educating young people, the greater the child's chance for success." "A well-managed classroom is a task-oriented and predictable environment." "If a student cannot demonstrate learning or achievement, the student has not failed -- we have failed." 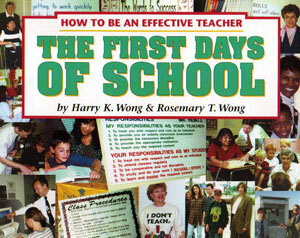 To order The First Days of School: How to Be an Effective Teacher, by Harry and Rosemary Wong, write or call Harry K. Wong Publications, 943 North Shoreline Boulevard, Mountain View, CA 94943. Phone: 650-965-7896.